Have you been declined for LTC insurance? Did you not even try assuming (incorrectly) that you can’t get it because of your stroke, Parkinson’s, Alzheimer’s, bad knee or hip, diabetes, etc., etc., etc.? YES! You can get Long-Term Care Insurance Regardless of Health! Perhaps you worked with someone who only dabbles in LTC insurance on the side. 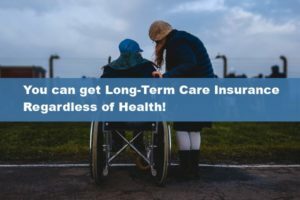 At TheLongTermCareGuy.com we have solutions for every situation, those with or without health, and those with or without money. We now have home care coverage for anyone who can be on their own for a month without help in the home. That includes people using oxygen, walkers, or with limited mobility. It does not matter what diagnosis you have or the medications you take. We have LTC insurance for people who are healthy of course (that is the least expensive way to address this), but we also have policies for people already in care, an assisted living facility, or even a nursing home. If you are facing Medicaid to pay for your care, we can protect some of what you have left before spending it all down to Medicaid impoverishment. If nothing else we can share some ideas that will save you money and trouble getting Medicaid. LTC planning is all we do, and have done for the past 24 years. The absolute least expensive way to handle this is by investigating LTC insurance while still healthy, and in your 40’s or 50’s. That is when the insurance is the cheapest and the policies we offer have built in inflation to keep up with the increasing costs of care. My own policy has that 5% increase in its benefits, and has kept up with increasing costs over the past 20 some years. Many surveys say costs are only increasing at 1% to 3% but I can assure you from seeing the bills that 5% is actually what is, and has been happening. Going forward, costs will increase even faster. If you have less than 5% inflation in your LTC insurance, you better be earning 10% on your investments to keep up – or come see us. LTC planning needs to take many other disciplines into consideration, not the least being how your budget will change when care is required. If you cannot drive, there will be less vehicles, campers, boats, motorcycles, snowmobiles, four wheelers, etc. Less golf, travel, even dining out. Taking these things into consideration you will find you may be able to cover more of the cost than you thought. The interest earned on your nest egg can also help without touching the principal. Then only the shortfall needs to come from some other source and we have access to companies your insurance agent or financial planner does not have access to. Companies rated A++ for financial strength, which very few insurance companies have. LTC insurance is tough for insurance companies as the claims can be HUGE. Thus you want a company that does not have a lot of their eggs in this basket. So, no matter your health or financial situation, an expert in this field can help you. You can get Long-Term Care Insurance Regardless of Health! We are your best source for information on dealing with LTC.